The murder of Marwa al-Sherbini, a 32-year-old Egyptian pharmacist stabbed to death in a German courtroom last week, has stoked growing anger in Egypt, where the local press has taken to referring to her as the "headscarf martyr." But with everyone from Islamists to the government claiming Sherbini as a symbol for their cause, her death is transitioning from shocking tragedy to a weapon of religion and politics. On July 1, as a pregnant Sherbini prepared to give evidence against a German man of Russian descent who had been convicted and fined for trying to remove Sherbini's headscarf and calling her a terrorist, the man ran across the courtroom and stabbed her 18 times. The attack has set off a wave of outrage in Egypt over what is perceived to be rising European racism and anti-Islamic sentiment. "What's the problem with wearing the headscarf?" asks Ahmed Kiskh, a Cairo convenience-store owner. "This is racism against Islam and ignorance about Islam." Adding insult to injury, many say, was the indifference of the Western press. German papers at first buried the story, while it took several days for papers in other countries to pick up on it. There was also the added detail that Sherbini's husband was shot and injured by a guard who at first thought he was the attacker. And all that was compounded by the initial lack of a formal apology from Germany. (On Thursday, German Chancellor Angela Merkel offered her condolences to Egyptian President Hosni Mubarak at the G-8 summit in Italy.) "Had the Muslim been the aggressor as the guards initially thought, the story would have made headlines ... It would have perfectly fitted into the promoted image of Muslims being aggressive, barbaric and uncivilized," wrote a columnist in Egypt's main English-language daily, Daily News Egypt. In Egypt, the reaction has been impassioned  some would say extreme. When Sherbini's body was buried in her hometown of Alexandria on Monday, thousands turned out for the funeral, raising banners and, according to wire reports, chanting slogans such as "The Germans are the enemies of God" and "Down with Germany." Sherbini's brother told the Associated Press that the family would "avenge her killing" and the Sheik of Al-Azhar, one of Egypt's top government-sponsored religious authorities, called for the maximum punishment for Sherbini's murderer. 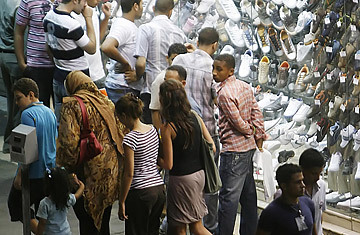 The Egyptian Pharmacists' Syndicate has even suggested a boycott of German drugs. Not everyone is buying into the frenzied rhetoric. " 'Death to Germany?' Why?," asks taxi driver Mohamed Abu Maryam, who says he is dismayed by some of the responses. "Why blame a country for the actions of an individual?" But for many, Sherbini has become a convenient martyr, an easy, emotional means to an end  or a distraction from Egypt's domestic woes. "The Islamists in Egypt have already [begun] using this as a card to mobilize for the veil  not for the right of women to wear whatever they want, but in defense of the veil," Hossam el-Hamalawy, an Egyptian journalist and author of the popular blog Arabawy.org, tells TIME. Indeed, Sherbini's heroic status in the Egyptian press appears in large part to derive from her determination to wear the headscarf in what has been painted as a landscape of cruel, racist taunting. Her death has also become the latest weapon in the controversy over remarks made last month by French President Nicolas Sarkozy in which he equated the most conservative style of Islamic women's dress, the burqa, with subservience. "This is cowardly act supported by many western politicians like Sarkozy ... We should stand against such an inhumane act," wrote one man on the message board of a Facebook group titled Defending the Rights of the Late Marwa El-Sherbini, which claims more than 1,000 members. But more salient than the women's-dress issue is the manipulation of Sherbini as a symbol of Islam in a perceived standoff between the Muslim world and the West. "She is a martyr of Islam, and justice will be served on the day of judgment," wrote one man on the wall of another Facebook group, Marwa El-Sherbini "Muslim Martyr." Even Iran, Egypt's traditional adversary, has joined the fray, holding a symbolic funeral for Sherbini in Tehran on Friday and summoning the German ambassador to the Foreign Ministry to hear Iran's formal protest over the attack. Some accuse the Egyptian government, too, of claiming Sherbini's tragedy for its own purposes. The attention the government has given the case  called a "bloodbath" in the state-sponsored press  strikes many in Egypt as contrived, given Egypt's dismal track record in protecting its citizens both at home and abroad. Human-rights organizations and the local press point to abuses suffered by Egyptian migrant workers in the Persian Gulf states as the government seemingly turns a blind eye. "The government is also trying to hijack the campaign and trying to present itself as patriotic in defense of Egyptians abroad," says journalist Hamalawy. "What do they do for the Egyptians who are in the gulf and who actually face similar treatment, if not worse?" For the man in the street, Sherbini provides an easy outlet for Egyptian frustration  a distraction, some say, from the more serious abuses of an authoritarian regime. "The whole thing is just stupid. But it's convenient," says popular blogger Mahmoud Salem. "It's an opportunity to have fake outrage because it keeps Egyptians busy." The ultimate impact of Sherbini's death remains uncertain, but what's clear is that Egypt will continue to hold the murdered pharmacist up as a martyr as long as someone, or some group, finds it useful to do so. "The debate could be taken in any direction at the moment," says Hamalawy. "It depends on the actors on the ground ... and how they are going to mobilize around it." See TIME's photos of Tutankhamun: the Boy King.